Sooooo, I was a little bit lazy when I decided to review The Mortal Instruments trilogy so, I wrote my review in bulk. haha. And right now, I feel like making a decent review for each book. Let’s start of with the City Of Bones. The story revolves around the lives of three Shadowhunters and two Mundanes whose lives are suddenly intertwined because of old secrets unknown to them. I have to be honest here the first part of the book was a little too bland for my taste but as the story progressed I found myself immersed in it completely. Especially the part where the Shadowhunters entered the picture. I like the dynamics and the interaction that went on between the characters. 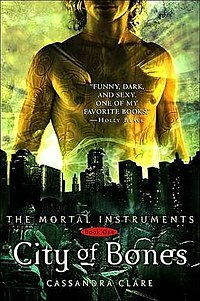 I actually liked Clary, though I still prefer Isabelle over her, in this first installment. She didn’t annoy me as much as she did in the last two books.And I love Jace, he is probably the hottest Shadowhunter out there. haha. Simon wasn’t given that much screen time or should I say page time in this novel. I love him and will always have a soft spot for him. I still liked his appearances in the book though. It might have been bland or boring during the first few pages or chapters but as the story progressed I found myself wanting to know more and more about the story behind each of the people involved. Cassandra Clare certainly knows how to pique my interest. The last three or four chapters of the book actually made me get out of bed and buy the next one. And I did. haha. I’d give this book a 4 out 5 stars.